Now is when my brain fries.Autonomous? ?Readings or now what was that other setting. Measuring the Antenna Height side side angle,or was that angle angle side or ? I understood it though I can not repeat all the correct terminology. 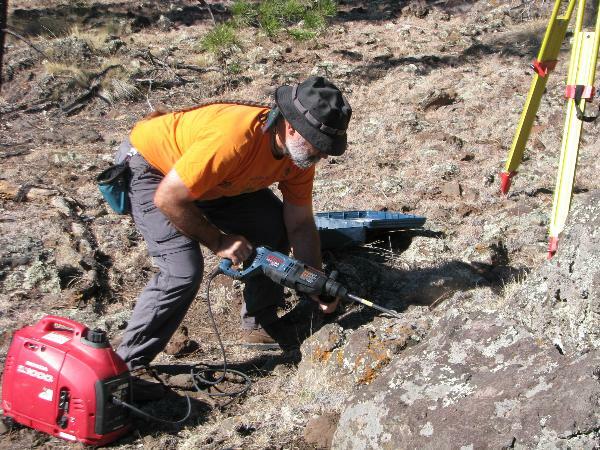 Got it all set up and leveled over the Datum Point and started collecting the data. He had 2 GPS Units at the sight now the other I am going to have to get a document to so I can tell you all what it all was. Gotta get my GPS in there. Looks like a heck of a lot of fun and a great crew attending and helping out as well!! Thanks for getting the photos posted quickly so the rest of us could share in the excitement! 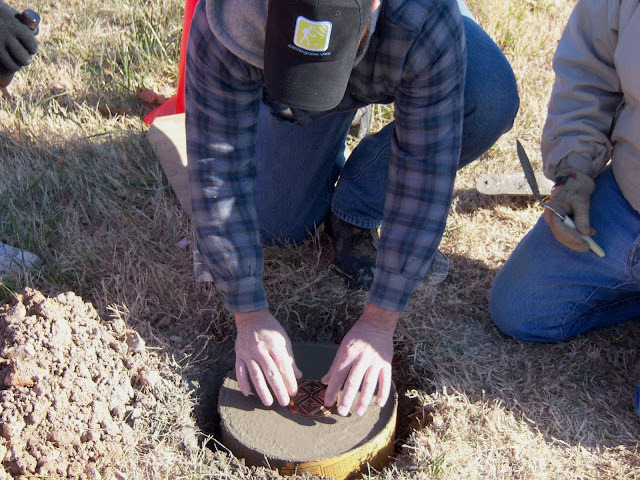 Wisconsin's GEOCAC Benchmark was set yesterday, 26 November 2008. Although, it will not officially be surveyed until spring. I was not able to get pictures as I had to work, but Mr. VanGoethem who is in charge of setting and surveying the mark, did take some. When I get them, I'll post. Here are some we took today! We just submitted the cache listing for this one as well. That is so cool thanks for adding the images. Brrrrrr and I just thought it was cold here. Looks like the 3rd in the Nation and the 1st for Wisconsin. I can wait for the springtime. I am working on our witness post, well got it done gonna drive it in on Saturday. 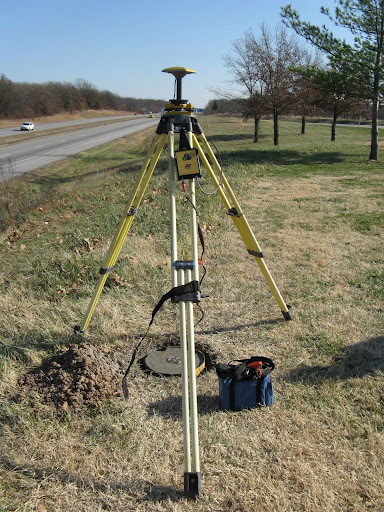 I have the cache at the benchmark or set within it but am also working on making it a multi and you may have to learn a little about surveying to find it. If you want to add it to the NSPS Project I can send you the html and you can change the required links to your state. (Edit) tried to add it but my html to BB aint good. 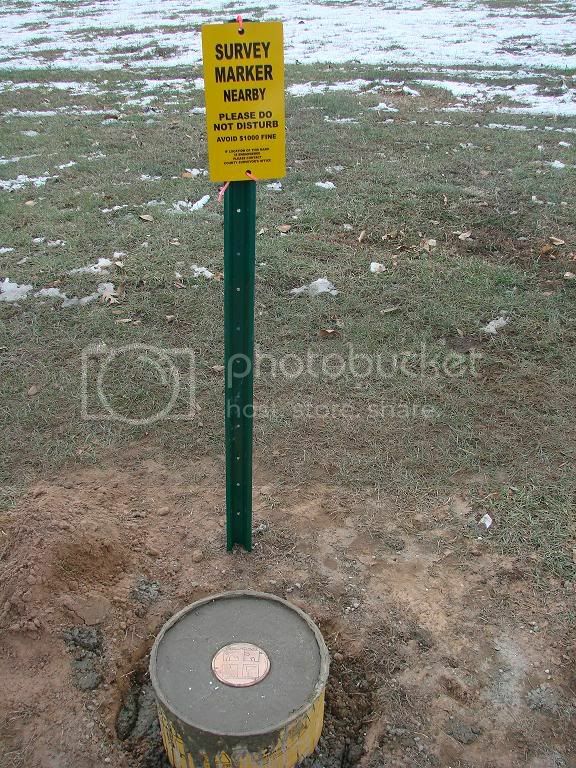 Wisconsin's GEOCAC Benchmark was set yesterday, 26 November 2008. What's that cylinder that the concrete was poured into? 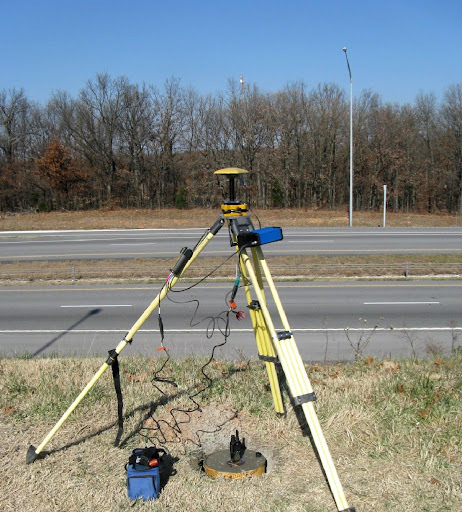 Is it something that surveyors use a lot, or something you came up with for the occasion? And it looks like the mark was placed right near the entrance to a company; is that where one of you works? BTW, can there only be one mark per state? It would be fun to talk the Berntsen folks into doing one! 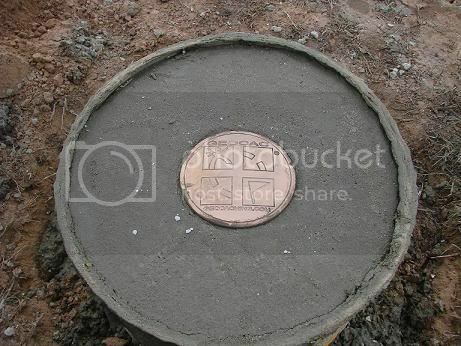 What's that cylinder that the concrete was poured into? It looks like a concrete forming tube. Basically a giant paper-towel roll! Fairly common on jobsites around here, comes in 6" to 60" diameters. Yeah, AZC is right, it's a concrete forming tube. We had great weather when they set the mark (sunny and near 40 degrees). 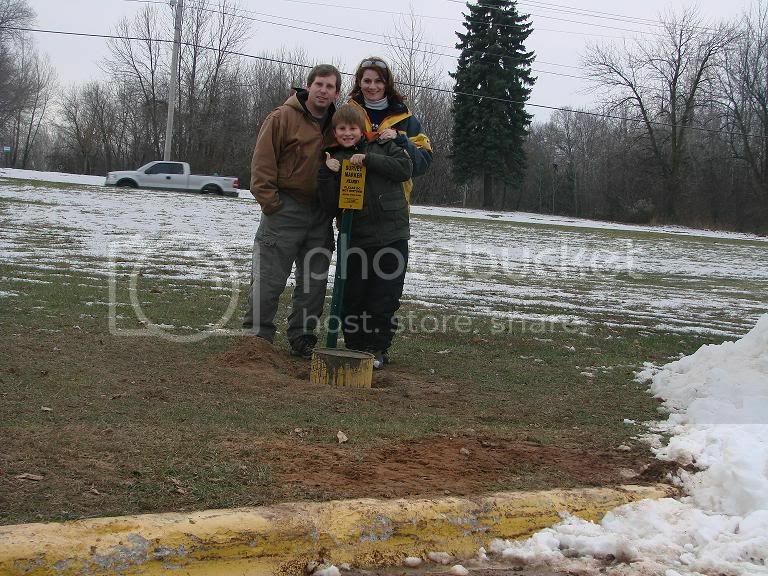 Yesterday, when we took the pixs and it was barely 32 with on/off snow showers. Gotta love Wisocnsin weather. The mark is located on the grounds of the local tech college. The school was kind enough to give us a bit of land for it and the project provided hands-on training for the many students who took part. Definately a win-win situatuion. Our cache is about a mile away from the mark. (I couldn't put it on school grounds). The location of the final is near a streetlight in some brush. Similar to some of the conditions we deal with when looking for marks. I thought it appropiate, We wanted to invlove more surveying skills in the cache, but haven't had time to get anything set up properly. But, we are working on it, and we'll probably put out the new one after it gets surveyed in spring. I should also mention, I stole some of the wording from AZC's benchmark cache page - it was just very well worded. Hope you don't mind! Winter as far as Berntsen doing one - I'm hoping to have just one per state. Kinda makes the mark and our work seem a bit more insignificant if there are two in the same state. That's just my opinion. Well, there wasn't much to steal, but I'm flattered! While I do think some states (California, Texas, and that huge frozen thing up north) are big enough to support more than one GEOCAC mark, I would say that there should be one in each state before we start doubling-up. As it stands, a friend of mine (50mm) and myself will be stepping forward to see what we can do to get a GEOCAC Benchmark set for Virginia. Glad to see your post in here. We will be working with you in any way we can. Great to see Geocac placements! Way To go! I am having issues with finding a placement. How many have placements picked out as of now? Ive debated hosting a event to get ideas of the ideal placement. I would like the placement to be beneficial to surveyors, accessible to finders while serving some sort of point of interest. While id like it right on top of a mountain right here in my home area, I dont neccesarily think it is the Prime placement for such a monument. Still gots lots of research, but the ball is still rolling here in CA! Thanks again for allowing me to be part of this project. Finally got our GEOCAC Geocache in order and published. I am working on a Missouri Challenge puzzle type cache which involves mathmatics and surveying type clues with bearings,azimuths and well better not give to much away yet. You might try Visitor Centers and maybe CALDOT (CALTRANS)I guess thats what it is there. There are always projects you could incorperate into the scheme. Maybe a famous Surveying point there are many in California but not sure of your area. What year was California founded? Can you get one of the Bi or sesqua centennials in. What is the Center of attraction? What would bring people to see something great. I been up to that area and it was awesome. Just open up your mind and think of all the possibilities that await your call. I know here in Wisconsin, ours in located at a non-main attraction site - at a local tech college. But it was close to home (Important for placing that geocache and maintaining it) and well, all the services and materials were provided for for free. Otherwise, putting it somewhere else more scenic, touristy etc, may have cost us to fork out the material and labor expenses. Something we could not afford. And the other good point, if its in danger of being damaged or destroyed, it can be removed, replaced and re-surveyed. Another bonus to ensure its longevity. These might be some points to consider as well. Just a thought. Very nice!! I look forward to seeing what you are creating with the puzzle. Maybe something I could use in some fashion to enhance our own cache perhaps??? Just a couple more hours before a full year on the GEOCAC Project. I would just like to report things are going well as far as I am concerned this date. 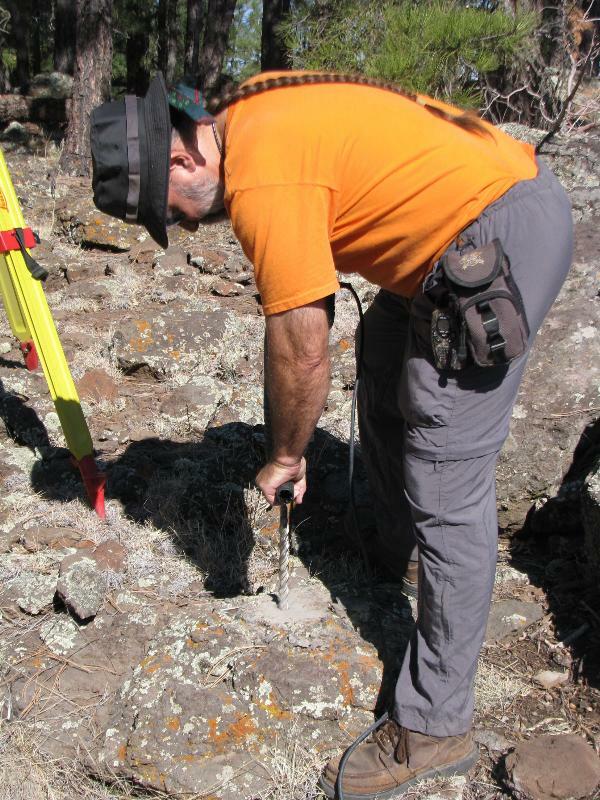 We have 3 GEOCAC Bench Marks set and 2 are awaiting the OPUS Data returns. I again thank all of those who have helped and a thanks for all those who are working towards their State Goals. I would also like to Wish you all a Merry GEOCAC Christmas and a very Happy and properous New Year in 2009. I just came across this thread & was blown away. I havent yet read all of the logs, which I know can be dangerous, however I have a few questions. I work with an organization & they just had 10 new benchmarks placed by NGS on their property. It is an environmental reserve. It would be great to place a marker by one of them with this GEOCACHE emblem set in it. Is the area accessible to anyone? I'm still working on a location for Okieland. Do I have a mark reserved, or does one need to be ordered? You can contact me through my profile and I can send you the project data. We can get them on pretty short notice. I was waiting till we get 6 States this time due to the fact that is how many I have to order at one time. If you would like the project if I have not sent it already shoot me an e-mail. We are at or near 6 more I think. Mt. Greylock was chosen because it is the highest point in Massachusetts.. 3.) Expect my order form to be sent to you by early next week. Hope you still have one for me. Now I just need to wait until spring for the Road to be opened after a 2 year repair. On a side note, can there be 2 in one state? I know some one on the east side of Mass that would love to do one out there. I will try to update it some more soon. That is the 3 that have already been set and associated Geocaches. These are the one's in the works. Yes, send me whatever you have. I'm working with the OSLS on permission for a site with good sky on the grounds of the state capitol. Likely could happen this spring. You need to send me your e-mail. As you can not send word documents over this server. I have a word document with all the info on it. Well, we did our best and we think we did a pretty good job. We set out the first GEOCAC in Iraq at our Event today at Camp Victory. We had to make do with some pretty rudimentary supplies and we only have our personal GPS (not much in the way of survey equipment over here-at least not accessible to me), but we had a blast doing it. I will post pics and coordinates later this evening. I know that the Precise details are well kept. That is fine I want to make sure you guys are well kept and safe. Thanks ATC06 and crew this is a great honor to me and again I salute you all. Very well done given the situations. And may this GEOCAC Victory pass along more Victories and bring you all home safe and sound. Thank you again for taking on this project. May we all meet on home trails soon. 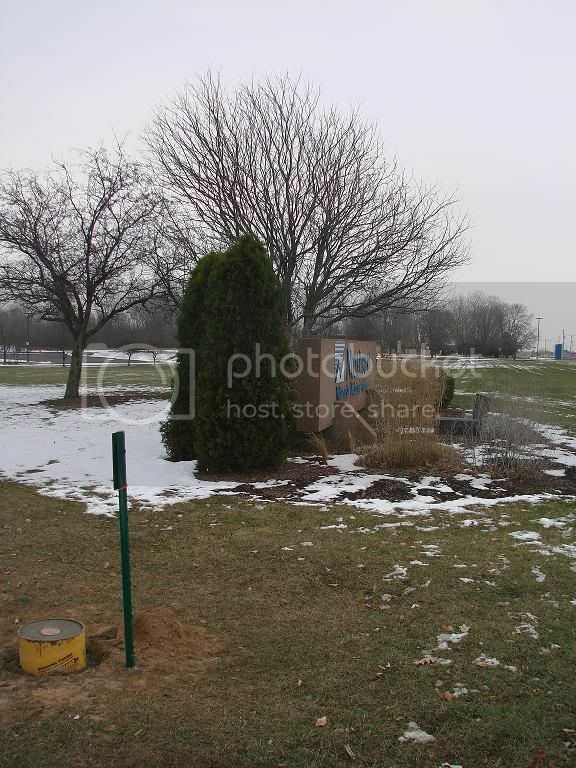 Yes the location is an environmental center open to the public every day but Christmas & NY's. They have joined with MAGC to place caches out there on the 500+ acres & to help introduce caching to the area. They are great folks. So When I saw this I thought it would be awesome if we could see about doing one out there. Oops sorry about the double post. I didnt do it on purpose. Fat fingers I guess or slow system. My bad. Mother Wolf you should have mail. I hope it does not take that long this time. I know we have pony express here but maybe they got a faster horse this time. I got an E-mail from someone,I think with the name of Paul??? Somehow I just lost it and never got to read it. If it was you please send me another and I hope you read the forums. If you know who it might be as well ask them if you can. I am trying to get all of my S*** together with this event Im sponsoring next month so I have set this aside for a few weeks. I will be asking some questions though & I appreciate the info. It will be a fun project for sure. Looks like I got a faster horse this time. I want to thank ATC06 for the U.S. Army Special Commendation. Sir I need to salute you!! Thank you for such a great honor. And A BIG THANK YOU for accomplishing the Mission. Please if you know a Vetran send them a Salute too. I am working on making a date for an event of which the Geocac placement location will be chosen... Only not exactly sure how it will work. Id like to get as many folks with ideas as to where the best placement should be. Has anybody else thought of this??? Id like some input on how the best way for this can be done. Id like for the placement to be some sort of group effort as "I" probably wouldnt neccesarily choose the optimum placement for such a monumental marker. ALSO... what would be REALLY COOL is for Groundspeak to create a "special" Geocac icon for either the Benchmarks and/or the Caches associated with the placement. Not only would that be cool, but it'd give another icon for your finds! Specially for the folks that love the icons! ~ I mean SHEESH...The APE caches have their own icon and there is only 2 of em! edit to add... I wonder who's arm we'd have to tug on to make that happen??? Man you have some beautiful country up there. I once walked hundreds of miles to sleep under one of those Majestic Redwoods. I even stayed a day or 2 in the Red River Valley and learned a little about Willow Bending. I will never forget Tom and his Willow Works. I had a blast through Hopland and on down the 101 Coast. There just has to be a good place close to ya. I have asked on the icons. Maybe if we can get more of em then maybe I will ask again. I don't know how to twist a frog's arm. Somewhere up your way - Stay in NorCal for sure. Avenue of the Giants? Standish Hickey? Over on the coast like Mendocino? Somewhere on the Eel River? Lots of cool places up there. I think California needs more than one. I don't know what it would take to get permission in the parks. I definitely prefer boulder/rock outcrop settings. Depending on the timing and circumstances I'd like to help. Bringin this one around around again, cuz I am still working on the placement... It got put on the back burner, but I need to get the ball rollin again. Plus I believe there are many states that have not been assigned someone to place it. Ill keep you updated here, I still need to make the initial contact to the CA Geodetic advisors and will do so... Can we get an updated list of the States that still need a placement? Are people still interested....? There are 5 set now. It has been slow I guess with the way the economy is. I am still here and just as interested as ever. ....... Are people still interested....? I'm in - Depending on the timing and circumstances of course. The one we had set in Wisconsin last November was surveryed this past April. I have not gotten in contact with the person responsible for surveying, but there was a nice gouged X in the center of the disc. Guess I should attempt another follow up when school starts again. I am interested in Utah, I did not see any takers on a quick scan. Let me know what you need, I can contact local colleges/surveyers that may be willing to help. Visited the missouri one on Sunday. The birds haven't been kind to it...if you know what I mean. I am in utah.. i wouldn't mind helping as well. Yes you know how birds like new shiny things to aim at. Send me an e-mail and we will get things going. Talked to cantuland over the weekend. 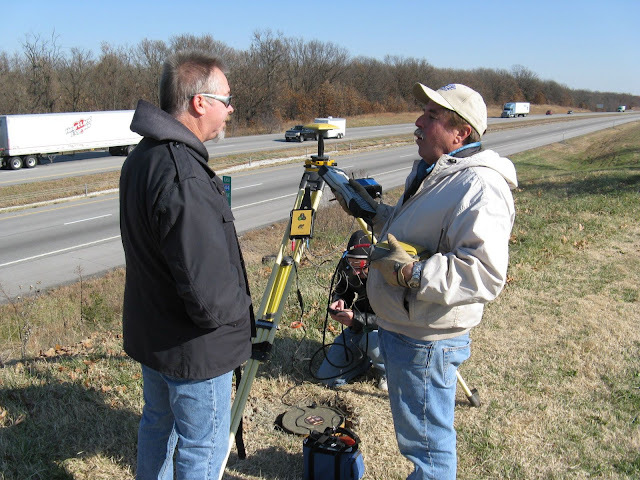 We have a tentative date for the setting of the Kansas GEOCAC Benchmark(s). He will probably follow up the post..I hope. The date will be 3-27-2010. Thought I had better get in here and post something as I have been to busy to be in here much lately. I am still out there. Still interested here. Since I moved this summer, talking to a few people here about getting one set in DC and Maryland.. It's in very beginning stages at the moment, however.